We eat an amazing lunch of rice, pea/lentil/green pepper yumminess, ugali (a corn staple here), fruit salad, and cabbage salad, chased down by lots and lots of water. It is only midday, but we have worked hard and we inhale the food and drink. After resting for an hour, we head out again and split up – sewing team is the same, while Andy and I put brand new sheets and pillow cases on brand new mattresses and pillows for the 14 children at the orphanage next door. They have never, ever slept on a bed and our gift to them is a bed for each, with sheets, pillows, cases, and blankets needed. We outfit the caregivers as well and they simply cannot stop smiling and saying thank you. It is neat to see how something we take for granted is a gift to others. I believe that these kiddos will be happy to get off the floor and that there will be some celebrating at their home tonight! I wrap up my day by joining Dan, Andy and Denys in painting the school. The school’s walls and ceiling are made of corrugated metal and it feels like an inferno in there. We slap on paint and we sweat. We stand on dirt floors as we paint and converse and Denys mentions how he has learned in the past 1.5 days that his life is good and that he has nothing to complain about. Hailing from Ukraine, he was instrumental in talking his company, Kromtech, to donate towards our work. He is here working side by side with the community to see what we do here and how Kromtech has helped and it is so neat to learn about him and his country while having him participate in a hands-on project such as this one. Evening comes and we slowly make our way back to the colorful guesthouse, where each room downstairs is a different color. Orange, pink, red, white, and blue decorate the bottom floor where we eat and lounge in the sitting room. Cold water showers feel amazing and soon, sleepy people make it to their rooms to sleep under blue mosquito nets and rotating fans. 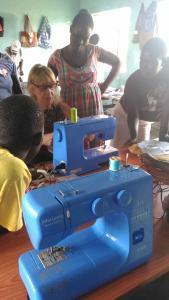 Another day arrives and I find myself teaching the sewing group about feminine hygiene kits, as they are learning how to make them and I think they should know the reason why. All the women and the two men present listen attentively and all the ladies smile and clap when they hear that girls can stay in school and women can go to work, thanks to the kits they are making. They get back to work with renewed gusto and end up with beautiful bags to carry their kits after today’s lesson. 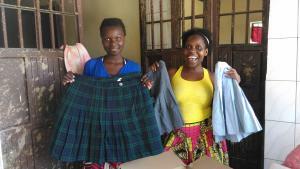 In another part of the compound, school uniforms are being sorted by Kathy and two local women. They count and inventory a colossal number of polos, pants, skirts, and sports uniforms sent by Lebanon Catholic School. I had no idea that over 750 polos were sent over! WOW! 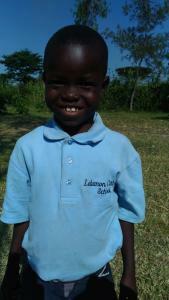 So many children will be wearing the LCS logo! Andy and Dan continue to paint the school. We are pulling them off for the afternoon, as the sun is high in the sky and the day has gotten too hot to paint corrugated metal. Instead, we will split up into sewing, library and clothing duties. Children yell outside as they play baseball. Aiden is the “confession stand”, giving out water to the others as they hit the ball with a pvc pipe and run around the bases in this incredible heat. I type in the comfort of the sitting room, enjoying the sounds of play before going out into the white to organize our work for the afternoon.